The Boyfriend Bid is a young adult contemporary romance by author Jodie Andrefski. The Boyfriend Bid was a really cute romance story from Engalanged Teen’s Crush line. I am always happy to pick up a new book by their crush imprint because I always know what I can trust to get out of the story. I always know it is going to be a super cute romance, with great characters and a healthy dose of heart, mostly done in a high school setting. And The Boyfriend Bid delivered on all of those elements. There was one aspect of the story that bothered me but it didn’t detract from my overall enjoyment of the story. In the Boyfriend Bid we meet our two main characters, Sarah and Chance. Chance is the school’s new guy and Sarah starts off pretty closed off to him. At first Sarah was a bit offputting to me because she was so, soo guarded, but watching Chance knock down her walls one brick at a time was super rewarding. Sarah certainly won me over, and Chance had a fan in me from the start. Sarah was burned by a soccer player in the past, so she wants nothing to do with Chance. Her friends put in a winning bid on him at a charity auction for school and their forced dating is off. I loved the idea of charity auction. I even liked the idea of how the dates got upped from one to six, but the whole student news story aspect of following them around and recording their dates really irritated me. It was a complete invasion of their privacy and I was really surprised that not only the both of them went along with it, but that the school overall was ok with it. I wouldn’t have been ok with it and I never would have agreed to it. The school basically had a chirty auction, took Sarah’s friends $300 dollars and then totally changed the rules of the game after the fact. But that was honestly my only gripe with the story. I loved the romance. I loved watching Sarah and Chance connect and slowly get to know one another. Nothing about their actual relationship felt forced (other than the fake news story dating nonsense.) or rushed. And I have to say this, both Sarah and Chance were great young adult characters. I really adored them, separately and together. 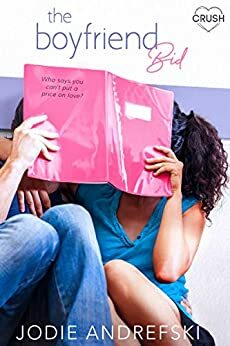 If you are looking for a fake relationship turned real type of story that has a different take on the concept, then I would check out The Boyfriend Bid. I think it will hit the spot for a sweet young adult high school romance. *disclaimer- I received a copy of this book for free. I was not compensated for my honest thoughts. Sarah is a girl with a broken heart. Her last bf was a jerk and she isn’t looking for a replacement. Her friends want her to get over her ex and take her out to the bidding auction. They have the intention of finding her a safe date. The dating bid gives Sarah and Chance 6 weeks to get to know each other. This is well written and fairly predictable. It’s what you think it’s going to be with a swoon-worthy ending. The Boyfriend Bid by Jodie Andrefski a five-star read you would bid on. This was such a great story, my first by this author and I hope not my last, it was sweet and romantic wit twists to keep you interested, there was a drama running along side and that was great, but it didn’t detract from the great story. Sarah Campbell was a great character and one you could get with, you can imagine her heading down the corridor and hammering nails. I love the way the author describes the minor details making you feel like you are part of the story, you are there with them smelling the sawdust and book dust. Pick this up if you want sweet romance that you will adore. I enjoyed the sweet side of the story and the fact that some prejudice the Sarah had seems to disappear the more she realizes not all people are the same. In the beginning I didn't really enjoy the fact she generalized sports players as being dumb. Overall a sweet read that keeps you smiling throughout. 4.0 out of 5 starsOne Tree Hill vibes! The plot of The Boyfriend Bid gave me serious One Tree Hill vibes, which I loved. One of my favorite episodes in that show is when the basketball team on there has an auction for the team and I just love the whole thing so that was what drew me in. This book had soccer players instead and there was a unique spin and someone ended up winning 6 weeks of dates with the main guy character. I thought the majority of the book was cute, though I admit I wasn't as hooked as I thought it was. I did like all of the friendships in this book though and I definitely want to read The Girlfriend Request so this is still rated high because The Boyfriend Bid made me want to check more of Jodie's works out. That's always a good sign with me still. I did like the ending and I liked how light and easy this book was once I got into it more. Thank you Netgalley and publishers for giving me the chance to read this book. This has no impact on my thoughts. I voluntarily read and reviewed this. My thoughts are my own.